What is Grenadine Event Planner? 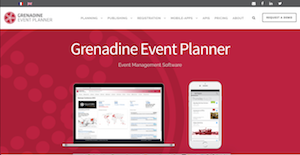 Grenadine Event Planner is an events management software that provides you with a complete solution for your events and conferences. The vendor offers a packaged solution for every stage of the event—from planning to execution—and gives users the power to track the progress of their events via web, through mobile applications, or even through customized APIs. Grenadine’s intended goal is to give its users a cohesive “integrated platform” from which to manage their events and staff. The vendor has developed the software with the intention of helping users filter out the chaos of running events. On the get go, Grenadine Event Planner sounds like it offers one of the most cohesive services there is in the industry. It has an event planner, marketing features for your event, and even a nifty reporting feature that lets you fine-tune your data. The event planner provides you with a portal that assists in the marketing of your event via the web marketing service. It also lets you schedule multiple schedules, and plan multiple events at any given time via the app’s dashboard. There’s also a web marketing service that lets you generate a website for your event. This is also coupled with a couple of interesting tools, including a sign-up snipped that you can embed on your other web properties, and even an event app that your users can download to their mobile devices. The events registration system is also made simpler. You can integrate the registration system with your Stripe account, which means you can process payments right away. And the system makes it possible for all incoming payments to be automatically marked for tax, making it easier to keep your books clear. The Grenadine Event Planner finally also has a robust reporting feature that lets you filter the data you need to pull. You can see a full list of your attendees and presenters, and it lets you filter through them using elements listed in their profiles—which means you can export fine-tuned reports after your event. If you are considering Grenadine Event Planner it might also be sensible to examine other subcategories of Best Event Management Software listed in our database of B2B software reviews. Organizations have different wants and requirements and no software solution can be perfect in such a scenario. It is futile to try to find an ideal out-of-the-box software app that fulfills all your business requirements. The wise thing to do would be to adapt the system for your special requirements, worker skill levels, finances, and other factors. For these reasons, do not hasten and invest in well-publicized leading systems. Though these may be widely used, they may not be the perfect fit for your unique needs. Do your research, check out each short-listed system in detail, read a few Grenadine Event Planner reviews, contact the vendor for explanations, and finally choose the app that offers what you require. How Much Does Grenadine Event Planner Cost? There are several pricing plans for the Event Planning service. These are for one user per month. We realize that when you make a decision to buy Event Management Software it’s important not only to see how experts evaluate it in their reviews, but also to find out if the real people and companies that buy it are actually satisfied with the product. That’s why we’ve created our behavior-based Customer Satisfaction Algorithm™ that gathers customer reviews, comments and Grenadine Event Planner reviews across a wide range of social media sites. The data is then presented in an easy to digest form showing how many people had positive and negative experience with Grenadine Event Planner. With that information at hand you should be equipped to make an informed buying decision that you won’t regret. What are Grenadine Event Planner pricing details? What integrations are available for Grenadine Event Planner? The events registration feature of Grenadine Event Planner integrates with the Stripe credit card processing service. Please get in touch with the vendor for more info on custom integrations. If you need more information about Grenadine Event Planner or you simply have a question let us know what you need and we’ll forward your request directly to the vendor.